As I wandered around Atria Shopping Gallery mall recently, one particular space had caught my eye. It wasn’t flashy nor was it very big at all. In fact, the matte black background could have easily blended right into the wall and gone by unnoticed by shoppers. However, even from a distance something stood out from Projek57’s brick-and-mortar store. Right at the front of the store was displayed a board of intricately woven threads. They intertwined between one another and spelt out the word ‘Hope’. Hope, smack dab in the middle of a mall, piqued my interest immediately. As I casually flipped through the rack of T-shirts which hung in various sizes and colours round the front of the store, Rachel, who is Projek57’s intern told me that over the past weekend, over 100 shirts have been sold. That seemed pretty impressive seeing as the physical store for the business had just opened for a duration of five days then. 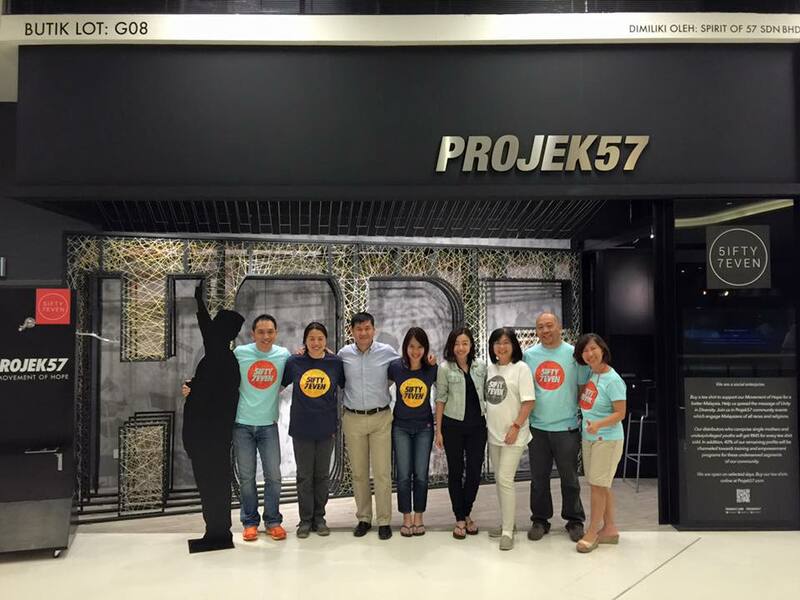 The Projek57 team relayed to a curious me that the name had stemmed from when the constitution of Malaya was formed and the founding value of our country was unity. ‘Projek’ on the other hand, always signified people coming together to work on something, and that is exactly what they are all about. Hence putting both words together, they form Projek57. 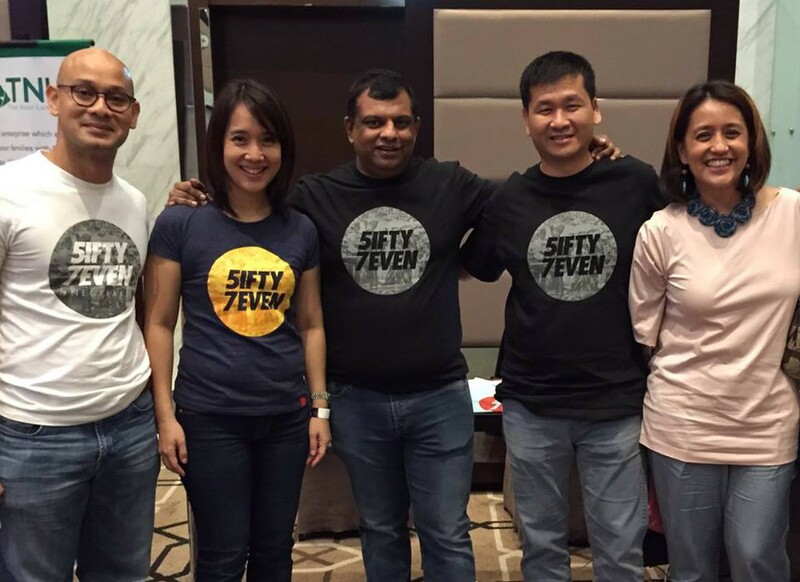 Projek57 started off as just an online store on August 31st of 2015, our country’s national day. It was apt that they did, seeing since their vision as stated on their website is to restore Malaysia to its founding values of 1957, which are tolerance, diversity, progressiveness and unity. 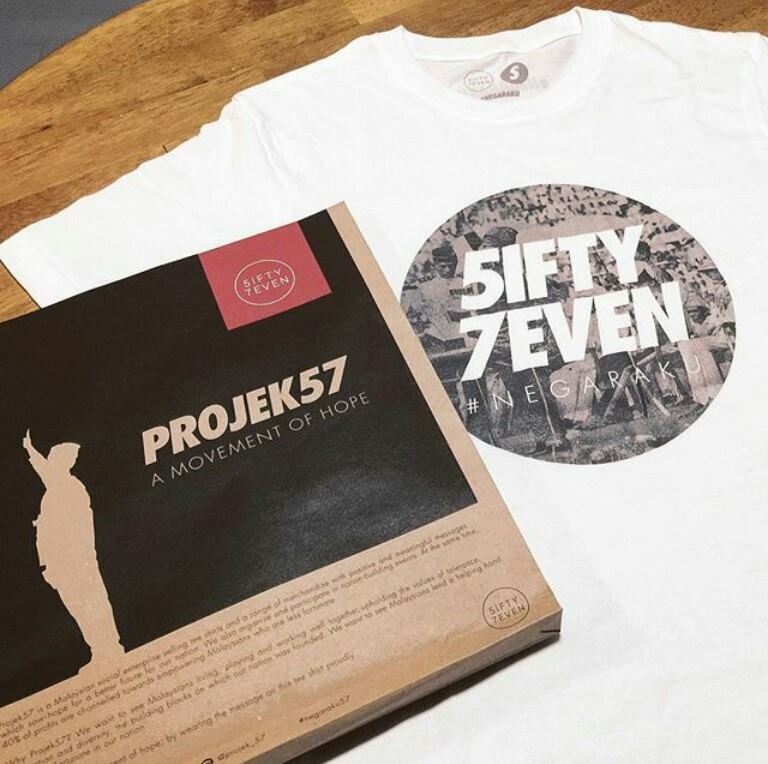 The way by which they send this message of unity across, is by producing tees and merchandises which display the Projek57 message. Their noble and patriotic goal has even gotten the attention of some Malaysian leaders such as Tan Sri Tony Fernandes who offered to repaint one of his AirAsia planes to feature Projek57 and Khairy Jamaluddin who wore their T-shirt with pride. With the print emblazoned on the tee in one way or another, it is bound to be a conversation starter and that is the team’s aim. 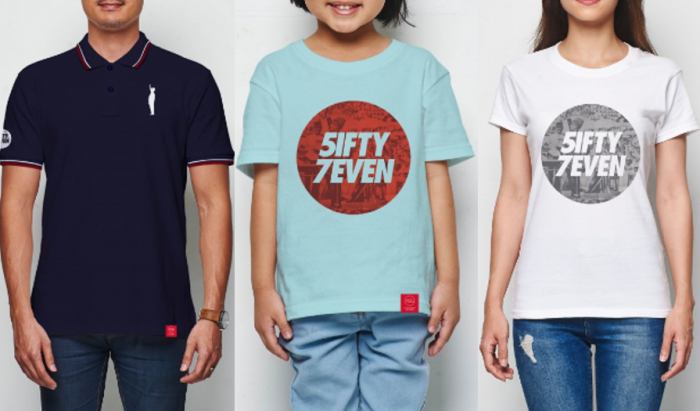 The shirts retail between RM38-RM48 and they are currently available in various styles such as the Classic57, Pop57, Microfiber57 and Polo57, and they also come in kids sizes alongside the normal sizes for both men and women. However, they are not just a producer of tees though, for Projek57 are more than that. 40% of the profits received from the sale of the tees and merchandises goes towards empowering single mothers and underprivileged youth. The team relayed to Vulcan Post that Projek57 are working hand in hand with partnership alongside the MyKasih foundation for this. If there is one thing Malaysians always look towards, it is to celebrate the rich culture that we can experience in our nation, and with everyone looking to have a personality of their own with various high street brands, it was interesting to see how this startup is creating tees which can unite people together within one single brand. It’s after all more than the brand, it’s the message behind it. A testament to them having succeeded in doing so, is when the team told Vulcan Post that they have managed to sell 2000 T-shirts thus far, having only been incepted for around 4 months. Witnessing how Malaysians have responded to Projek57, they then set up a brick-and-mortar platform in Atria Shopping Gallery on New Year’s Day 2016. This was done mainly to crystalise their presence and to show people that they are serious about their cause. Also, if people wanted to have a look and feel of the tees, they could do so at the physical store. What makes the store unique though is that it’s interactive. The team said that their design narrative was to have the screen with threads spelling out the word “Hope”, and the reason behind it is that one thread will be weak and many will be strong. This could also apply to the unity within our nation as well, seeing since one person alone seeking unity may find it harder, as opposed to an entire nation seeking it together. The team at Projek57 said that their hopes for 2016 would be that they can be a platform for single mothers and underprivileged youth to learn about retail and become their distributors, where for every tee shirt they sell, they get RM5. This thus enables them to earn seed capital for their own ventures, or help their family such as their children’s education. “We will also definitely be looking to include more merchandise. We have already started working towards this end,” shared the team. Thus far, Projek57 has been able to directly impact the community and the way they do it is with patriotism and style.